Last week I got the chance to deliver an excellent training to almost 30 people from the Romanian Public Administration. It was great to talk to them and discover what the issues are in their organizations. The training was about Time Management and Stress Management. I got the chance to apply myself Time Management techniques because we only had 9 hours available in 3 days and I had to focus on what’s important and do my best to help them practice during the training what they learned. We had fun, we learned a lot and we also relaaaaaaxed in the last day. The participants were engaged by some very interesting exercises to be more efficient in less time and focus on what’s important, and with a final relaxing exercise when for 30 minutes they experienced several techniques like breathing, music, progressive muscle relaxation, Time Line Therapy, anchoring, visualization etc. 1. In the photo above you see the jar that I used for a Time Management demonstration. That jar is a metaphor for your life: in order to be fulfilled you need to fill it first with big rocks, the big and important things like family, health, career, friends, development, spirituality (and other important things for you that are not necessarily urgent), then fill it with pebbles and sand and water (that are the other things in life). 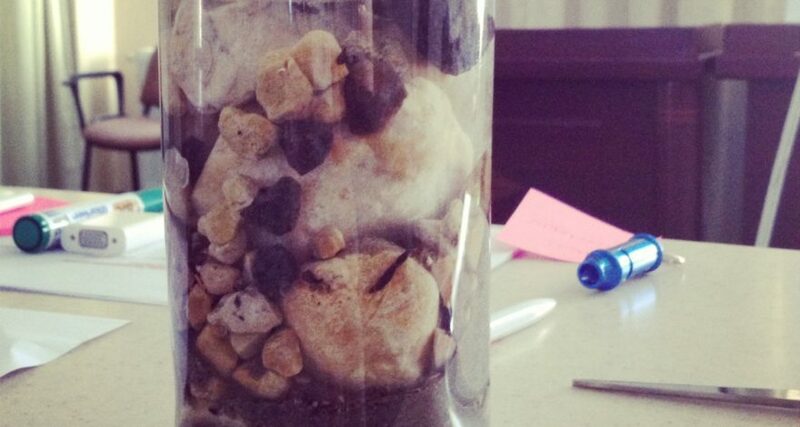 If you fill the jar with the sand first (that is represented most of the times by the urgent things that are not really important), you will not be able to put in the big rocks anymore, so you will not have time left for the important things. 2. One of the exercises we had was to brainstorm on what you can do to use fully 5 minutes of your free time. We often think that 5 minutes of our time are not enough to do anything. But we are wrong and we got during this exercise around 100 ideas on how to spend this time. These are only a few of the ideas that they came up with. So we can do so many things with the 5 minutes that we have between one task and another! How can you invest 5 minutes daily for yourself?